Herbivory by fishes has been identified as a key ecological process shaping coral reefs through time. 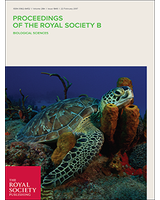 Although taxonomically limited, herbivorous reef fishes display a wide range of traits, which results in varied ecosystem functions on reefs around the world. Yet, we understand little about how these trait combinations and functions in ecosystems changed through time and across biogeographic realms. Here we used fossils and phylogenies in a functional ecological framework to reveal temporal changes in nominally herbivorous fish assemblages among oceanic basins in both trait space and lineage richness among functions. We show that the trait space occupied by extant herbivorous fishes in the Indo-Pacific resulted from an expansion of traits from the ancestral Tethyan assemblages. By contrast, trait space in the Atlantic is the result of lineage turnover, with relatively recent colonization by lineages that arose in the east Tethys/Indo-Pacific. From an ecosystem function perspective, the Atlantic supports a depauperate fauna, with few extant herbivorous reef fish lineages performing each function. Indo-Pacific fishes support both more functions and more lineages within each function, with a marked Miocene to Pleistocene expansion. These disparities highlight the importance of history in explaining global variation in fish functional composition on coral reefs.